Hledáte silnice, cesta = road? road=silnice, cesta goodbye=na shledanou today=dnes their=jejich who=kdo programme=program OK.=Dobrá., V pořádku. silly=hloupý, pošetilý I love you.=Miluji tě., Mám tě rád. where=kde Best wishes=(fráze na konci dopisu podobně jako S pozdravem) nice=příjemný, milý please=prosím Dad=táta, tatínek garden=zahrada very=velmi classroom=třída (místnost) Where are you from?=Odkud jsi? 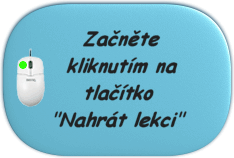 be afraid=obávat se, bát se letter=dopis she=ona he=on song=píseň they=oni, ony, ona Let's have a look.=Podívejme se. Použití pojmu road ve větách. Small clouds passed over the road, soundlessly shedding their mass to the air. There was a defeated look about the few faces they glimpsed at the roadside. On either side of the road the cultivated fields looked parched and dusty. Manžel je kontrolorem u firmy Morton a Waylight v Tottenham Court Road. Na North Road nasednul Ozzie na autobus, kterej ho zavez k nadráží. Just a few congealing rivulets dribbled on towards the main road. He took a deep breath, and wandered into the middle of the road. Mick crossed the road, squatted on his haunches and picked one. Navštívil Commercial Road a mluvil s Dvorakem. The road was hot, but there was a slight breeze. The Srbovac road was empty in both directions. It was like following a well marked roadway. Kráčela po Kennington Road a já za ní. Firmě Holloway a Steele na Edgware Road. He drove slowly, looking for side roads. Nervously, Judd glanced along the road. The question marked a fork in the road. She had passed the mailbox on the road. There were small roads on both sides. Wandsworth Road, řekl můj přítel. He drove off down the access road. As she reached the road to St. Not a major road, certainly. He continued along the road. He pointed along the road.